Since 1996, Angel cologne by Thierry Mugler has offered the casual male a scent that is perfect for any occasion. Its intriguing mix of mint and coffee combined with lavender and caramel makes this a fantastic scent for your next social event. Whether it is a dinner with family or a get together with friends, this scent is the perfect complement for your next event. Angel is great for the man who likes things a bit laid back. I have been buying Angel for Men for years for my husband. We both love it! Smells just a little more masculine than Angel edp. 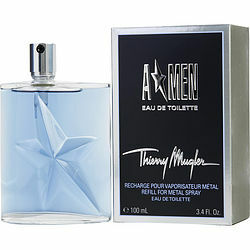 A*Men by Thierry Mugler, my new best favorite. I just got it yesterday. I put on 1 spray after a shower and before night sleep. I woke up 8 hours later and still had a strong A*men smell. I love this fragance!! !